for it is verrie sweet and artificiall." The viols were bowed instruments with frets. They were usually played held downwards on the lap or between the legs (the name viola da gamba translates to leg viol). The tone is quiet but with a rather distinctly nasal quality which many think makes it too restrained for dance music but an ideal instrument for polyphony where the clarity of texture is so important. 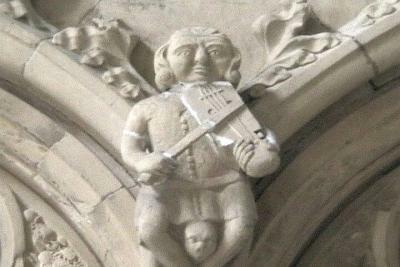 The viol played on the lap was known in Europe as early as the 11th century, and is pictured in the art of the time. 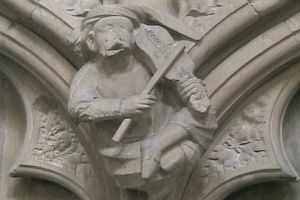 After the 13th century this style of playing bowed instruments had almost completely disappeared, only to re-emerge two centuries later as the popular Renaissance viol. The viols were used so much by court musicians throughout Europe, that it was explained that the viol was played by genlemen, merchants and other men of virture, while the violin was played in the streets to accompany dances or to lead wedding processions. The instrument was introduced to the English court of Henry VIII by Italian and Flemish players and soon became popular with amateurs as well as court musicians. Like madrigal singing, viol playing had become part of music-maiking in the Elizabethan home by the end of the 16th century. Viols were popular in England long after they had been replaced by the violin on the Continent. The body of the viol was lightly constructed and the six strings were under rather low tension. Common sizes included the treble, alto, small tenor, tenor, and bass. The strings were usually tuned in a sequence of a 4th, 4th, M3rd, 4th, 4th (d-g-c'-e'-a'-d" for the treble). The frets were made from pieces of stretched gut, and were tied around the neck with a special fret knot. The frets could be pushed around for easy tuning. The bow is rather convex in shape, as opposed to the violin bow's concave bend. It is held in an underhand grip, the palm facing upwards. C. Simpson said in 1659, Hold the Bow betwixt the ends of your Thumb and two foremost fingers, near to the Nut. The Thumb and first finger fastned on the Stalk; and the second fingers end turned in shorter, against the Hairs thereof; by which you may poize and keep up the point of the Bow. Danoville in 1687 gave the advice that the viol bow must be of Chinese wood, and should not be too heavy, because it makes the hand clumsy, nor too light, because than it cannot play chords enough; but a weight proportioned to the hand, which is why I leave that to the choice of the one who plays the Viol. 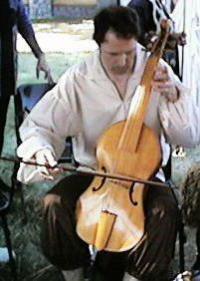 Musica Antiqua's treble viol was made by Hart; the tenor viol was made by Glan y Gors.